Going by the tasteless movies that the Chopras (Yash Raj films) have been dishing out of late, I remained reluctant all this while to watch this Shah Rukh starrer and just kept on pushing it away as long as I could. And then yesterday, out of the blue, I chose to watch Jab Tak Hai Jaan (I still don't know why I did that). May be because with his untimely demise, the movie unfortunately turned out to be Yashji's last souvenir to Hindi Cinema and no one sane enough would want to miss out on feeling and experiencing the love and the romance that he had epitomised so many times in his movies in his own inimitable style. Neither could I. I was expecting to see that distinctive 'Yash Chopra charm' in character development and direction, with which he had weaved so many unforgettable romantic movies over the years. After all, he isn't called the 'King of Romance' for nothing. But alas... the movie left me disappointed. Going by his own standards, Jab Tak Hai Jaan was unworthy of Yashji. Well, keeping the movie aside, let me focus solely on this particular song. I have often been a late bloomer in liking songs (and it reminds me of that Lifebouy soap ad, "Hey Bunty, teraa saaboon slow hai kya?" ). Actually it has often happened with me in the past too when I would take a liking to a particular song much much later after its release. Though I might have overheard a bit of this song before, perhaps a couple of times on TV, but I had never heard the lyrics in their entirety until yesterday. So as I was watching this song yesterday, I gradually started feeling a surge of emotions inside me as the song went on. The lyrics do raise a gamut of emotions in the listener's heart (if one tries to understand the underlying meaning of the lines in the song, he/she will surely feel for that crazy lover depicted in the song). This song, penned by Gulzar sahab, has to be one of the best compilations to have come out in the recent times. Coming at a time when ludicrous songs like 'Chikni Chameli' and 'Fevicol Se' are topping the music charts, the lyrics of this song seem so much like warm butter, simply melt in the mouth. Though the typical Punjabi verses were initially difficult to comprehend but each word said, as well as those left unsaid, leave an impact. Such a nice poetry of human emotions! 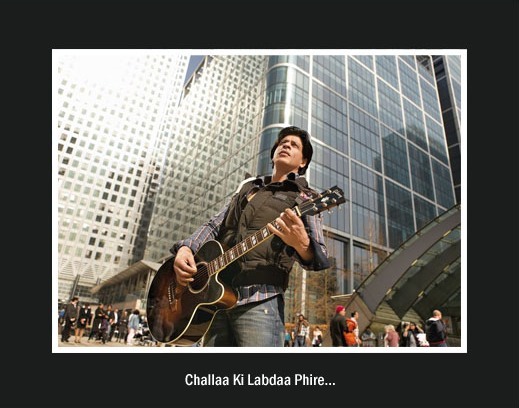 Challaa gali gali ruldaa phire..."
("Hey wanderer, crazy in love, what are you searching for? Asking people here and there, where the one for you resides? but I can smell her fragrance wrapped around my soul"
Yaaron oda ghar kedaa? Lokaan ton puchdaa phire..."
but this prisioner of love is yet to released! will come to me someday..."